Blog | How Can Physical Therapy Help After a Car Accident? How Can Physical Therapy Help After a Car Accident? This blog speaks to motor vehicle accidents (MVA), and how physical therapy can be an instrumental tool in helping you return to your optimal life post-accident. MVA’s are quite common and can lead to long-lasting side-effects that can be detrimental to our overall physical and mental health, and may limit your ability to perform simple daily activities pain free. In this blog, we are going to address the effects of a motor vehicle accident on your body, as well as your vestibular (balance and coordination) system. One of the most prominent injuries related to MVA is whiplash. When we are the target of an impact from the rear of our vehicle, our bodies are immediately thrown backwards into the seat and then forward against the seat restraints at great velocities, creating excessive stresses on our tissues and joints. 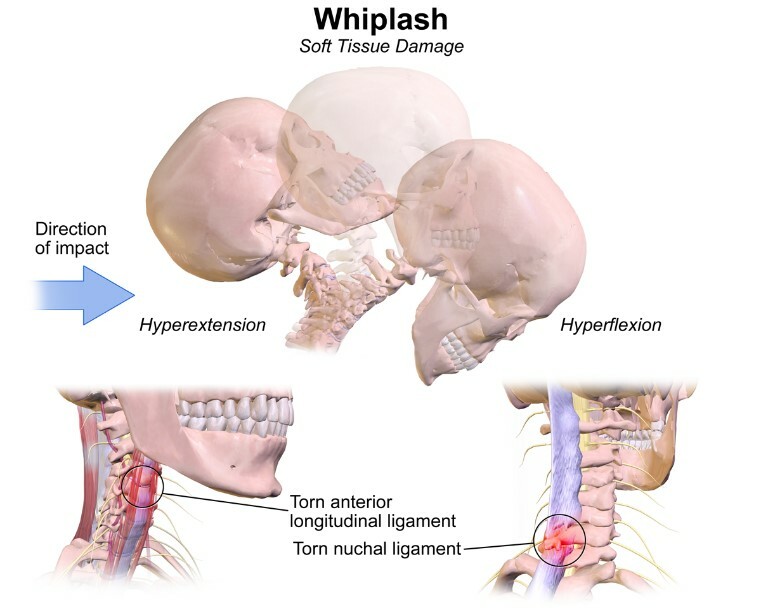 The most common symptoms from whiplash are neck stiffness and pain, along with frequent headaches. These symptoms are quite often caused from sprains and strains, which are tears of our muscles and ligaments. These are structures that keep our cervical vertebrae and joints in proper alignment and moving fluidly. (See attached image below.) The most acute symptoms typically last from 2-8 weeks, which is the normal time frame it takes for damaged tissue to begin to repair itself. So, what exactly is the cause of these symptoms? As stated above, severe neck pain can often be related to tearing and damage to the muscles, tendons, and ligaments, but these symptoms should alleviate before they become chronic. Chronic pain is a term used to denote when a symptom has lasted longer than the normal healing time, usually anything lasting longer than 3 months. Recent research has shown that chronic neck pain and headaches can be the result of weak or damaged deep cervical flexor (DCF) muscles. So, what does that mean? Our DCF muscles are fine movement and stabilizer muscles. Their job is to assist with fine neck movements and keep the upper cervical (neck) vertebrae stabilized during more forceful movements. In the case of a whiplash accident, recent evidence has shown that these muscles can be significantly weakened for reasons not completely understood. When this happens, the larger superficial neck muscles, which include the sternocleidomastoid (SCM) and scalene muscles try to take over their job of stabilizing our neck. These larger muscles however are not designed for fine movements and stabilization, they are too strong and often create repeated hyperextension of the upper cervical spine in the process. This repeated hyperextension leads to compression of the cervical vertebrae (neck pain) and pinching of the sub-occipital muscles (frequent headaches). On the bright side, physical therapists utilize specific tests to determine if your DCF are weak and if they can start you on a specific exercise program to wake up and strengthen them, often relieving neck pain and alleviating headaches. I have attached one of my favorite exercises for DCF strengthening below. As stated earlier, a MVA results in high velocity forces against the body and this also includes our inner ear and the brain which both help regulate the vestibular system. 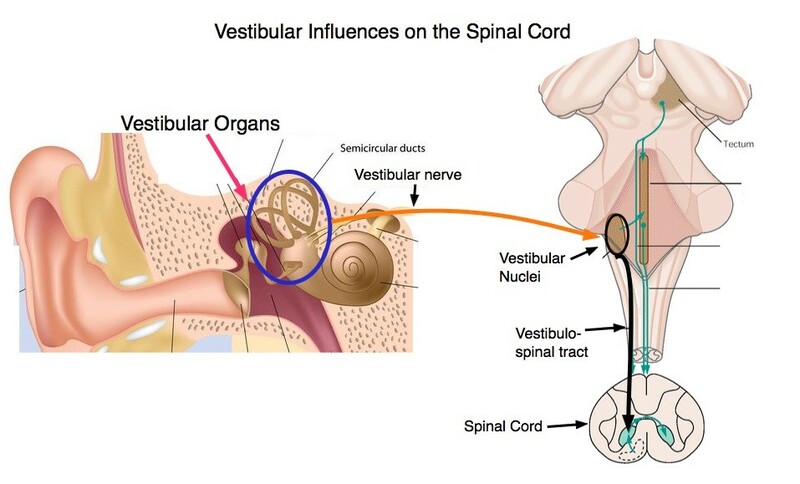 The vestibular system is made up of our inner ear and several reflex pathways in the brain, most importantly in this case, the vestibulo spinal reflex (VSR) and the vestibulo ocular reflex (VOR). These systems all work together to regulate our ability to track objects, balance with our eyes closed, and recognize where our limbs are in space without actually having to look at them. For example, if I raise my arm I know when it is above my head without actually having to look at my arm. However, when we are involved in a MVA, one part of the vestibular system may become disrupted, and this disruption leads to mixed signals being sent to the brain. These mixed signals often cause people to feel dizzy or nauseous when quickly turning the head to see something, or a feeling of unsteadiness when performing common daily activities. If these symptoms sound familiar to you, then it is likely you have suffered from some damage to your vestibular system. It might sound scary when you are told that your vestibular system has been damaged, but rest assured that these symptoms can be addressed and alleviated with the performance of proper exercises and management of a skilled professional. The most common exercises performed for individuals suffering from dizziness and nausea are gaze stabilization exercises. See the attached videos for a couple of my favorites. These exercises will likely make you feel dizzy and nauseous, but with time and practice will retrain your brain and restore proper vestibular pathway signal firing. A physical therapist can quickly determine if your symptoms are related to vestibular dysfunction and develop the proper exercise plan to get you back to feeling normal. I hope this blog helped answer some of the questions you may be having concerning MVA’s, it’s effects on the body and vestibular systems, as well as ways to help alleviate your symptoms. If you have recently been involved in a car accident or know someone who has please contact the professionals at Pro Physio and they can help get you back to feeling yourself again in no time.